Productivity, efficiency and profits have all soared within the manufacturing industry thanks to the advent of machines and robotics. The benefits do make a strong case for the technologies’ advancements and complicated implementations; however, these systems aren’t free of hazards, especially for the workforce that operates on them. Vital safeguards must be introduced throughout the plant floor to ensure human lives are as safe as possible, as well as to prevent productivity from being halted at any point. In light of the risks advanced robot - particularly those of collaborative nature – carry, several governing bodies such as OSHA, Robotics Industries Association (RIA) and British Standard European Norm have ramped up efforts to introduce regulations that would protect employees. The safeguard that needs to be implemented depends on the application and its scope. Risk assessments have already been mandatory under the regulation R15.06, years before the current machine guarding regulations came into effect. Point of operation guarding is one of the most involved aspects of this regulation as it has an effect over both safety and efficiency of the plant. Total perimeter guarding is seldom the solution as most machines still require frequent human interventions or guidance, e.g. welding. Point of Operation regulations require the layout, scope and associated hazards to be considered, after which methods are devised for their reduction. The most suitable machine-guarding device can be identified by the distance formula presented by OSHA. The formula allows a specific location to be assigned to the safeguarding device, while also taking into account secondary hazards that may interfere with the workers’ safety. Presence-sensing devices are one of the most common and simplest devices used in the manufacturing industry. Examples of these devices include laser scanners, curtains, infrared sensors, etc. Usually, the seizure in operation is caused by a disturbance that breaks the light contact or fluctuates the pressure setpoint. While these devices are known to be reliable, they aren’t the best solution for plant floors that incorporate large work cells, as this would increase the time employees need to walk between the non-operational machine and safety area. It is also possible that in order to avoid this extra time, employees may look for loopholes within the safety cell, thus ultimately defeating the purpose of this implementation. Moreover, the safety implementation wouldn’t work with machines that produce roll inertia as the machine comes to a halt. These sensors may also reduce the overall productivity due to false-positives. As infrared beams are not visible, a worker may trip them unintentionally leading to a lock down. Also, rough factory conditions may expose the sensors to dust or other contaminants resulting in unnecessary tripping. A better alternative to light curtains in certain situations is a fast-acting automated barrier door that instantly eliminates exposure to the harmful condition of the machine, as well as the secondary hazards produced by the process. Automated barrier doors and roll-up curtains offer a higher level of protection of point-of-operation guarding, by reducing access to the process as well as hazards such as smoke, flashes, etc. vital in operations such as welding, lifting, etc. Since there is no depth penetration factor involved with interlocked automated barrier doors, the safety mechanism isn’t held up against OSHA’s distance formula. This allows them to be deployed a lot closer to the hazardous area. As a result, the safeguarding mechanism saves space and boosts the productivity of the associated process. The space saving benefit in particular is valuable for a lot of facilities as this allows workers to move freely and stand closer to light scanners. Ergonomically, the operator’s motion would also be limited, thus improving productivity. Furthermore, it also brings down the risk of accidental entry into the work cell by another worker who is unaware of the layout as physical separation is clearly visible from all sides. Every time new machines or robotic equipment is introduced by a facility, the manager responsible should perform assessment to be sure of the mechanism that needs to be implemented while carefully identifying the line between safety and efficiency. 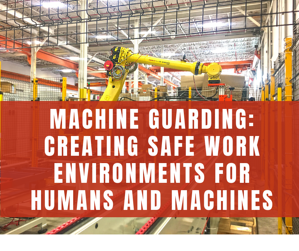 Do You Meet OSHA Standards for Machine Guarding?